Devthought had a little CSS tip the other day that is definitely worth repeating. It's not new, it's just an important little trick to know. If you use width or height tags to resize images in your markup, IE will ensure they look incredibly awful unless you use this little snippet. In general, resizing images in the browser isn't recommended, but of course there are always exceptions. heard of bicubic resampling before, never realised IE could do it! thnx! oh nice, great little tip! what would one of those be? There’s a lot of gray area when doing client work through a cms, especially with the client who just doesn’t “get it” or understand how to resize images/the benefits (no matter how much education they go through). It helps when you need several sized thumbnails of an image and, because of the CMS you are using, you don’t want to create and manage 5 different copies of the same image. You can scale the thumbnail and have one image download for all instances of that image at slightly different sizes. You certainly don’t want to have a high-resolution image squished down, but it does save bandwidth and server calls to reuse small images. Chris C. this Hack just work with .jpg and .gif (without transparecy). Using EM mesurements for images. In one case I’m working on now I have to create a text resizer and the images need to scale with the rest of the document. Thanks. That is very useful information. I’ve bookmarked this article and tweeted it. Never knew such a trick exists.. Thanks. This would be useful in a gallery… you could get away with uploading only the large version of the image, even for the thumbnail! Never heard of this. Great find, Chris! IE has a capability (under Internet Options) to load a default style-sheet that is applied to every page. If you create a style-sheet file with this rule in it, and set IE to load this file as a default-style sheet, you can enable bicubic scaling for all images in IE. Single best CSS trick I’ve gotten from this site. Wish I knew about this years ago! That’s a good tip, hopefully IE8 will have that be the default. I can’t imagine why anyone would ever want the current behavior. the “-ms-interpolation-mode” seems to be IE 7 only, you will need a AlphaImageLoader Filter for IE 6. What?! I never, ever knew you could do that. Why on earth does IE7 default to not doing this? Is there any legitimate reason why you wouldn’t want an image to scale smoothly? It won’t validate because it’s not valid CSS. It’s proprietary CSS for Internet Explorer. Just like -moz-border-radius is for Firefox. If you want to keep your master CSS file clean, put the proprietary CSS in a IE-only stylesheet. Or make a “dirty stylesheet” where all the proprietary styling goes. 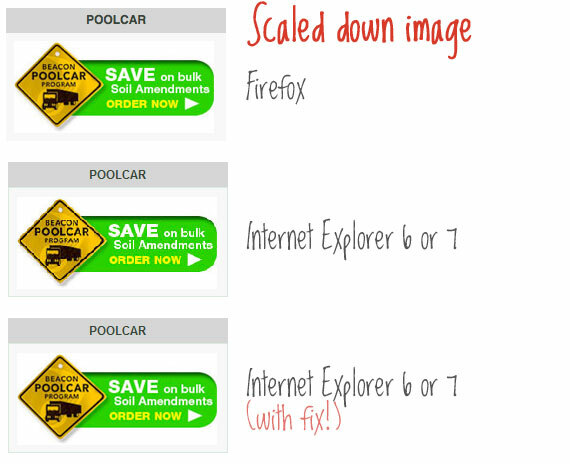 Nice, but: Why would you want to scale an image client-side and not just provide a scaled version from the server? You can’t always do that. I think even WordPress scales images. I’ve never heard “-ms-interpolation-mode” and I rarely scale images. Anywayz…tnx for posting this one. Cheers! I never believed in resizing images in the browser but as Josh N. says in his comment, if it’s the same image with just a slight difference in size it makes sense to do it, saving space and bandwidth. Cool little tip. Thanks for sharing! Excellent! But I noticed it doesn’t work too well or at all in IE6 anybody else noticed this? That’s the best tip I could ever have since some time, since a lot of portuguese still use IE out of ignorance. Pretty simple and yet very powerful tip! But a good, quick fix when used sparingly. Nice one Mr Coyier, really useful when you can’t guarantee all of the images will be resized properly by the client. Great tip man, thanks for mentioning it! Great tip, is there a way to do this for PNG? Incredibly handy. Thanks for this tip! As a nice side-effect, you can publish large images at any size you might have without having to pay a bandwidth premium. Even though it is somewhat piggy-backing on Flash it perfectly degrades in situations where Flash is not available. As it’s still quite rough around the edges, I’d love to hear your feedback! Good, but not work in IE6.